Mains unvented water systems are getting more common nowadays they are high pressure and will work with most bathroom taps and kitchen mixers and thermostatic showers. The flow and pressure you will get from this type of system will depend on the incoming water supply but it will also be restricted by the specification of the unvented cylinder. 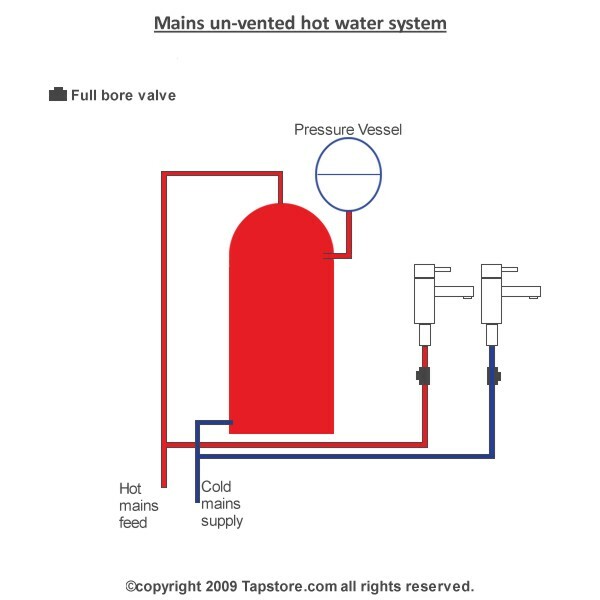 These types of systems are very efficient at heating hot water and have the benefit of storing the water so you can get much higher hot water flow rates than a combination boiler. An example of this is if you have a mains water pressure of 4bar the cylinder might have a max inlet pressure of 2.5bar also if you have a flow rate coming into the property of 35 liters per minute the cylinder might have a maximum flow rate of 22 liters per minute. You should not get a mains unvented hot water cylinder fitted if you have less than the specified flow or pressure as you will not be happy with the performance, if you have had one fitted and want to know how to solve any flow or pressure issues then feel free to contact us for technical advice.